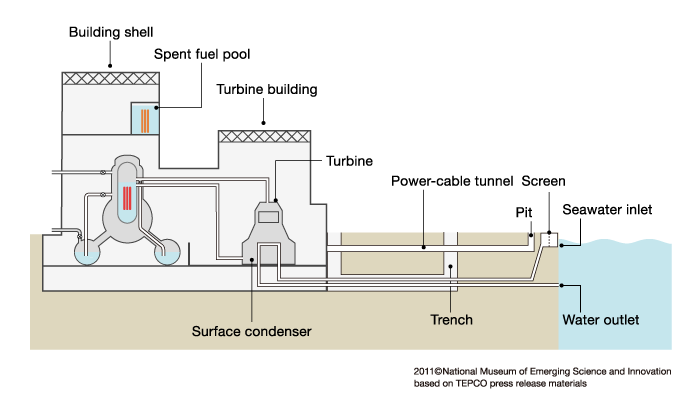 The mechanism of the unit 1-5 reactors of the Fukushima Daiichi nuclear power plants, including the reactor building, turbine building, and other facilities connecting to the sea, is schematically shown. Among the six reactors in the plants, the units 1-5 are the Mark-I type BWR. Turbine: It turns a generator with steam produced in a pressure vessel. Surface condenser: It turns a steam coming from the turbine into water. Water goes back to the pressure vessel through the cooling water system. Seawater inlet: Seawater is used to cool steam down into water in the surface condenser. After going through the surface condenser, it is released to the sea from the Water outlet. Screen: It filters trash out from seawater before sending the water into the plant. Pit, Trench: A tunnel outside of the plant buildings. In unit 1, 2, 3, 5, and 6 reactor buildings of Fukushima Daiichi nuclear plant, radioactively contaminated water was found in the tunnels.